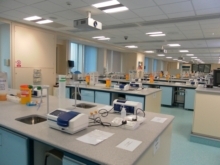 The new teaching floor of Bradford University's Biomedical Sciences facility accommodates up to 200 students, with Jenway 6300 and 6305 spectrophotometers chosen as standard equipment across the super lab. Having a strong ethos of 'Making Knowledge Work', Bradford University's continual investment ensures a world-class teaching and learning environment with state-of-the-art facilities. One result is that 128 Biomedical Science students can now be taught in a single space, with the option of increasing the total to 200 students by using a second laboratory linked via multimedia communication systems. According to Andy Reed, Superintendant for Biomedical Sciences, "It was decided there would be significant advantages in using the same equipment throughout our new super lab facility. For example, all student instruction cards and literature for practical classes could be identical. Having been a Jenway customer for some years, we favoured the company's products from the outset of planning for the super lab. Our standard pH meters are all Jenway 3505 instruments and we now have a total of 102 Jenway 6300 and 6305 spectrophotometers installed. As well as being very user-friendly for the students, the instruments are simple to maintain and provide excellent results for photometric measurements in biomedical and clinical science experiments. 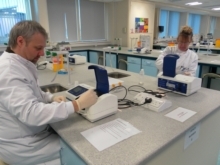 Use of the spectrophotometers is also included in compulsory tests which check whether our students lab skills reach the level required for their course and for future work following graduation." Designed for use in education, Jenway's 63 series of spectrophotometers are high quality, low-cost units ideally suited to applications in schools and colleges, as well as in QC and testing procedures for many different services and industries. The 6300 visible spectrophotometer covers the wavelength range of 320 to 1000nm, while the 6305 is a UV/vis model with a pulsed xenon lamp. Both accept a wide variety of sampling accessories which add to their versatility.